Ever since the concept art and 3D models of the new Raiden were released, I and fans alike all wondered how he ended up that way. It was later confirmed that a different studio other than Kojima Productions was working on the game and a new question entered our minds. Could a new studio take the lineage of the Metal Gear Solid franchise and the character Raiden, and do them both justice while simultaneously creating something new and exciting? Platinum Games have attempted to do just that with a lot of criticism aimed at them from mainly the Metal Gear fan base, so did they manage it? 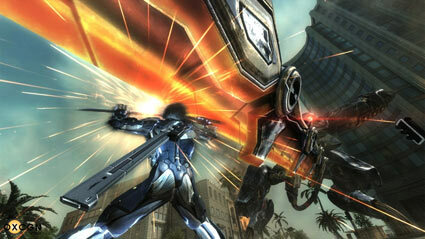 Metal Gear Rising: Revengeance departs from the stealth gameplay loved by fans of the Metal Gear franchise, and trades it in for intense sword action. There are a few references throughout the game that do hark back to the MGS series as whole, despite the radical new direction Rising takes. Codec calls are still present, as well as certain sound effects and voiceovers, and there are a few characters from the Metal Gear universe that make an appearance. There are also several not so subtle references such as the ability to hide in boxes that we have come to know and love, but at its heart, Metal Gear Rising: Revengeance is a hack ‘n slash game in the Bayonetta/Devil May Cry vein. So if you are expecting Raiden to sneak carefully throughout the whole game then you may as well avoid this game. However, if like me, when you saw Raiden in a cutscene in MGS4 tearing the large Gekko mechs to shreds and were dying to play that, then MGR: R is exactly where you want to be. The biggest change that immediately leaps out at you is the completely new control scheme, and in turn, the gameplay which now incorporates the classic heavy and light attacks seen in similar hack 'n' slash games such as God of War or Devil May Cry. Simply pressing these buttons leads to a flurry of attacks all incredibly animated, which flow from one to the next fluidly. However, I did find that this meant you couldn't interrupt an attack animation mid-flow and dodge an attack, which was much more likely to occur on enemies that can take a large amount of damage. A fatal flaw in the new controls was the lack of a block button; I searched throughout the game just in case I missed something, but came up with nothing. The main reason for this search was because I realized after my first playthrough that there was a dodge command (X + Square) that the game fails to inform you about, which I found very annoying as it would have made certain stressful situations a lot easier. Instead the game utilizes a parry system that is very precise, and requires you to aim and attack in the same direction and at the same time as the blow you are about to receive. This sounds simple on paper, and in one-to-one situations is straight-forward, but when you are put up against several enemies or you are attacked off-screen it proves to be quite laborious. Another factor that adds some frustration to this parry system is the poor camera. There is no real "hard lock-on", and by that I mean something that centers the camera to the target and leaves you facing them at all times during the battle. This is doubly worse when you consider that a lock-on isn’t even implemented in boss battles, many of which feature fast moving enemies that attack you from all sides. Although the camera causes some problems with the boss battles, it by no means ruins the experience. After you have perfected the parrying system, you will find yourself countering a sequence of attacks in perfect synchronicity with your attacker, and this is probably why I found the boss battles to be some of the best in the entire series, and would hold them close to those in Metal Gear Solid 1 & 3, and are by far better than anything in MGS4. They are definitely the highlight of the game, because each one has "trick" in beating them, and discovering it is highly satisfying. The pacing of Metal Gear Rising is nearly second perfect, you are always doing something, and something interesting is always happening. There is never a dull moment in this insanely awesome game and I never felt bored for a second, a thing I have come to expect from Platinum Games. Cutscenes don't drag on like in the Metal Gear Solid series, and when codec calls happen you can move Raiden freely at walking pace and importantly, they are also skippable. New enemy types are introduced frequently to mix things up, and you will find that you never want to fight a certain type of enemy because they are so difficult to defeat.